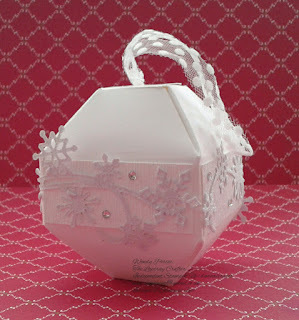 A new challenge for the Crafty Angels this month was to make something from a Tic Tac Toe box of suggestions. In case you don't know what Tic Tac Toe is, its a bit like a Noughts and Crosses game, but instead of just having noughts and crosses, each box is filled with a suggestion of what to make or use. My project is this pretty Christmas bauble that I have CASED from the lovely Sam Hammond-Donald, known as Pootles. Sam made hers in pretty Designer Series Paper, but I think it works well in just Whisper White with the addition of a bit of bling and sparkle. It can be hung on the Christmas tree and is generous so could hold quite a bit, as you can see. It is closed by and hangs from a piece of Whisper White Polka dot ribbon. Cut Whisper White cardstock to 10 1/2" x 5 1/2"
Score on the short side at 1, 4 1/2"
With the small score line on the right hand side, score on the LONG side to the first score line at 3/4", 1 3/4", 3 1/4", 4 1/4", 5 3/4", 6 3/4", 8 1/4" and 9 1/4"
Flip and repeat the scoring on the long side again. Fold along the score lines and manipulate till you get the right shape, this can be a bit time consuming, so be patient, it will be worth it. punch a hole in each of the top flaps and thread through ribbon to hold closed. Please click on the links below to see the projects made by the others who took up the challenge. Whilst you are visiting Papercraft with Crafty's blog, please watch out for the card made by Linda Brown from my team (called The Crafty Piglets) who joined in the fun too. 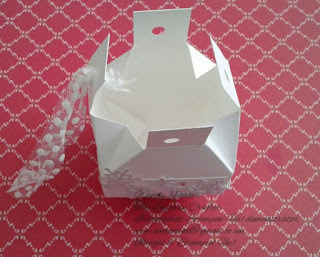 Linda chose Birthday/Card/Embossing for her inspiration and she has made a lovely card. Here is a list of the supplies I have used to make this project. If you would like to purchase any of these crafty goodies, please click on the picture and you will be taken straight to my shop for some retail therapy. All content of this blog is the property of Wendy Porter, The Lsotray Crafter, Independent Stampin' Up! 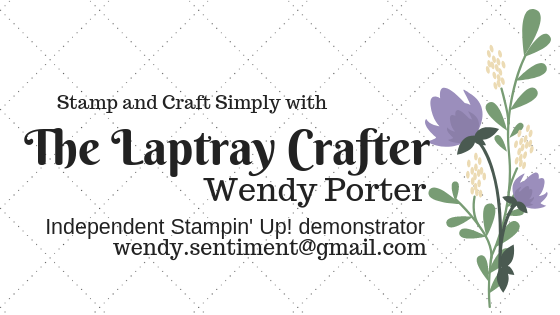 Demonstrator and is not endorsed by Stampin' Up! The projects, ideas, photos and articles are shared for your personal use only therefore I would ask that you please use my creations as inspiration OR link back to my blog. Images may not be reproduced for website, competition, magazine or book submissions, removed, duplicated or copied without my express permission.